One of the most common questions we get here at Miles Less Traveled is “What I should bring for clothes in this type of weather?” Or, “what do I need when I’m traveling to this part of the world?” Over the last few months, we’ve been trying to answer these questions in a series of posts. Whether it’s our list of absolute essentials that we bring with us every single time we travel, the full itemized list of what we brought when traveling around the world, or a very specific guide to packing for an overnight volcano trek, we are working hard to ease the anxiety for how to pack no matter the place, time of year, or activity done during travel. This post aims to cover one area of this: a full packing list for hot weather. Whether to escape the cold winter in the Southern Hemisphere or to fully embrace the warmth happening in the Northern, many people strike out to travel this time of year in hot and humid climates. As with every packing list, the specifics of what you will need will vary depending on location and planned activities. I am basing this hot weather packing list on the traveling we did in Southeast Asia. By bringing the items below, we felt prepared for doing all kinds of activities in the heat. From hiking Mt. Rinjani, to running a half-marathon in Cambodia, and lounging on beaches in Vietnam, we had everything we needed and then some. The gear did not protect us from the sweating that accompanies eating spicy soup on a plastic chair under a tarp when it’s 90 degrees out with 80% humidity, but I’m honestly not sure there’s a way to prepare for that. This list is for both men and women and has enough clothing to last for 7 days that can easily be packed in a carry-on! Pack light! The beauty of traveling to warm locations is that you won’t need much. Recycle clothes whenever possible! This is always on our packing tips, but honestly, who needs a new outfit every day when you’re off exploring? Sleep in the shirt you wore during the day, and use it as a workout shirt once it’s reached its capacity for daily wears. Bring Quick Dry Clothing! We think quick-dry clothing is the absolute most valuable thing you can bring when traveling. It’s light, durable, breathable, and obviously, dries quickly. This means it can be worn during water activities (kayaking, hiking to waterfalls, etc), while running, or simply during really warm days without getting as gross as its cotton or linen counterparts. If your hot weather vacation is on the beach we would advise cutting this list down even further. There’s no need for multiple pairs of shoes if you’ll be barefoot 90% of your vacation. Note: The links below may contain affiliate links meaning purchasing an item through them will give us a small commission at no cost to you. 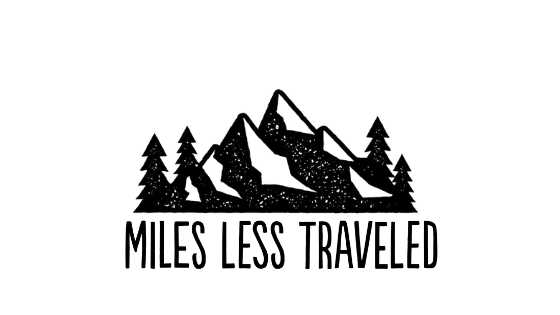 Thanks for supporting Miles Less Traveled! Shoes are the hardest thing to get a handle on for active travelers. We’ve fallen victim many times to the old “But what if I end up needing rock climbing shoes” adage before. The thing is, most activities can be done in the same kinds of shoes, and if there’s ever a need for something very specific, they can be rented from an outdoors store or scrounged up on the internet. In hot weather, you really don’t need much on your feet. These can double up as water shoes for beaches with lots of corals and rocks or when walking through streams and lakes where you may not want to touch the bottom. We use Keens which are sturdy enough to tackle most day hikes we attempt, however, they will not replace hiking boots for longer or more intense treks. Sneakers are the best fit for us since we use them for long walking days and sightseeing runs, however, any light shoe is good for this. We have also used TOMS in the past when we wanted something a bit more fashionable than a traditional sneaker. If it’s strictly a beach vacation and you don’t expect to workout on land, this type of shoe can easily be skipped. We had originally hoped the hiking sandals would replace these, but alas, we missed the freedom and lightness of throwing on a pair of flip-flops. While becoming a sweaty, smelly, mess, is unavoidable in our experience when vacationing in hot weather, there are some small things that can help the cause. Hygiene is often one the last things on our minds when we’re off adventuring (swimming in the ocean is nature’s shower, right? ), however, we recognize the need to stay on top of this a bit more than normal when traveling in high temperatures. These are the items we brought in addition to the usual suspects. A great refresher for a midday sweat cleanup, face wipes are light, can easily be thrown in a backup or your pocket, and give an immediate feeling of release from the constant sweating. It’s hot, and you will likely be in tight quarters with others. Do the right thing. A little luxury Alicia likes. This spray is great for a hit of moisture to the face while on the plane or in very hot climates. Preferably reef safe, especially if there are reefs near or you plan to dive or snorkel on your trip. Almost all of these fall into the category of “want” versus need, however, they are items that have made our travels in hot weather more enjoyable, and we still think they’re mostly practical. Especially useful for vacations where security is a problem, this is an easy solution to keep valuables off the beach and on your person when playing in the nearby ocean. It’s also useful for activities on the water, i.e. kayaking or stand up paddle boarding, where you run the risk of coming back wet. We like baseball caps for keeping rain out off our face and the sun out of our eyes during runs, hikes, and while lounging at the beach. Especially useful if not staying in hotels or resorts. Towels can also double as an exercise mat for in-room or at the beach yoga or mat workouts. Do not add to the waste concerns of any country you visit. There are so many great waterbottles and filters out there, all of varying sizes and styles. Find what fits you best. Not a need, but a want. This speaker does not get really loud, but it is incredibly durable, waterproof, affordable, and small. Bonus: it can clip right onto your backpack (also has been tested on the front of a kayak). Another item that is not a need but can make a big difference in an unairconditioned room or tent on a hot night. The white noise also helps block out street or wildlife sounds if needed as well. Some of these we’ve seen on other lists and some we’ve brought ourselves but all of them we found useless when tested on the road. Whatever the reason, these are the items we would not bring on a hot weather trip. Sarong – Alicia has never worn them when she brought them. The cover-up/dress is more stylish and can be used in other settings, win-win. Jeans – In any form (shorts, pants, skirts). These take longer than normal to dry and are thick and heavy, not great for heat and moisture.